November’s settled in and temperatures have dropped significantly these past several days. Making the gardening rounds to harvest the last of the herbs and tomatoes for the season, I noticed bright red peeking out from the midst of the yellowing leaves. Reaching into the tomato plant, I plucked what you see in the photo here. 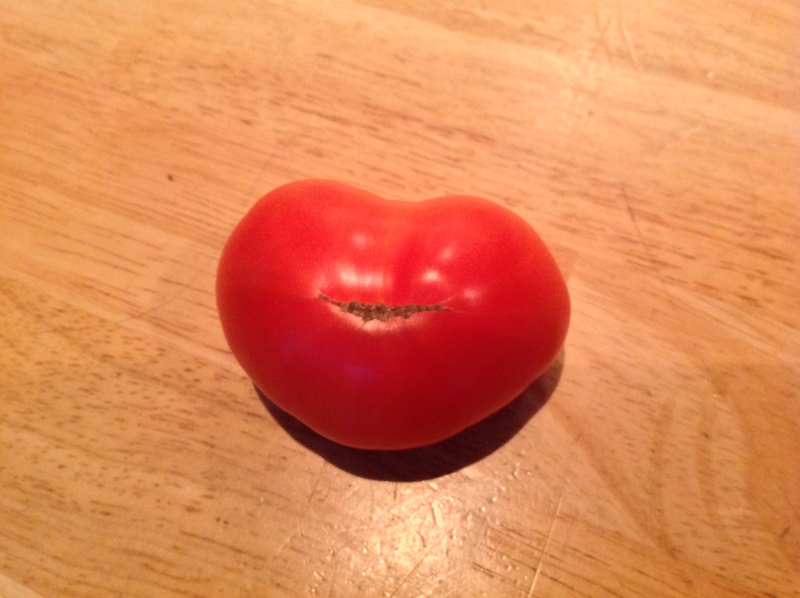 Imagine my surprise and delight at seeing a smiling heart-shaped tomato! I was immediately reminded of those who fill my life with love and joy. With Thanksgiving approaching and Christmas rapidly overtaking it, this small tomato brought me fully to the present, thankful for all whom I love dearly. Providing a cushion in some cases, a springboard in others, each has encouraged me to be myself and helped me to surrender the roles and stories I held onto tightly. Len, my partner and husband, has been witness to my struggles with darkness and joy for thirty six years and is still by my side. I’ve often thought it must be challenging to live with me given my drive to know and understand the ‘why’ of it ALL — but I guess he’s up for it since he’s still here and he tells me I can still surprise him. Francesca, whose very presence made me not only a mother, but a mom. Seeing her courageously stepping more and more into her Self each day continues to inspire me. Because of her, I am grateful for many of the choices I’ve made and the understanding that came with them. Zack brought me the amazing gift of my darkest fears. He had the courage to not back down until I surrendered them. At 20, my son still challenges himself (and me!) with a depth of wit and wisdom seldom seen in many his age. And then there are those friends who stood steadfast in their love for me, respecting that I needed to go deep on my own and allowed me to push back at them vigorously. Much to my surprise, they were there when I was complete, no matter how hard I pushed or how far away from them I went. Each in their own way has taught me what it is to be ‘a friend’ by allowing someone into my life who doesn’t have to love me, but simply does. They knew my heart sometimes better than I did and waited for me to catch up to myself. Next Next post: status quo?